Soft, delicate and pretty, these Elle Bamboo Sheer Stripe and Spot Anklet Socks give the illusion of pattern just floating across your feet and ankles, with two velvety, opaque designs on transparent backgrounds. The contrast of the matte pattern and the slight sheen of the sheer portions looks just fabulous with pumps, sandals and sports shoes. 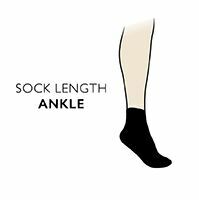 Each pack of Elle Bamboo Sheer Stripe and Spot Anklet Socks has two pairs, with comfortable flat seamed toes, heels and slim cuffs made with soft, gentle, skin-loving bamboo fibre.